This year get ready for a rally of a different kind. The National gets set to converge on Sydney, kicking off on the 9th of September 2011. On the 10th of September, HART St Ives will be playing host to the Sydney Scooter Expo, which in itself is incorporating this years National Scooter Rally. An event where scooterists from all over Australia will converge on one location in central Sydney. For the Saturday(10th), HART St Ives will be hosting the Sydney Scooter Expo. All the top manufacturers will be at the event, each brand will have a fleet of test scooters ready and waiting for you to ride on the day. 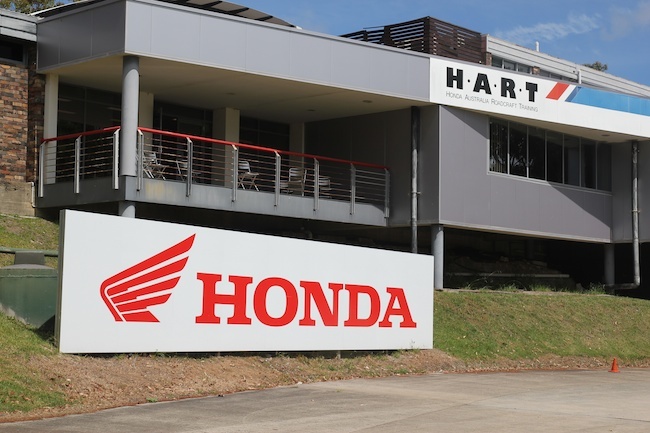 Imagine being able to ride every scooter on your shortlist, all in one location, within the safety of the HART rider training facility. See the latest gear on display, get the latest info on accessories for your ride. Wanting to display your wares at the Expo? Touch base and register your interest by contacting Scootersales.com.au. More information will be available shortly including an itinerary of events that will be happening across the 3 Day National Rally....... Stay Tuned!!!!! 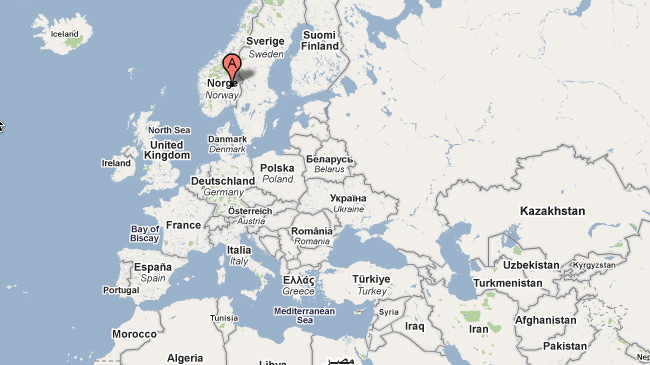 Vespa World Days this year made its way to Norway. A group of enthusiasts helped celebrate the 65th Anniversary. 150 Vespa Clubs, 20 countries of origin, more than 1000 Vespas officially registered and a crowd of Vespa enthusiasts who came to Gjøvik from all over Norway: the Scandinavian triumph of the Vespa community. Gjøvik, May 23rd 2011 - Yesterday afternoon the 2011 edition of Vespa World Days, the great world gathering of Vespa enthusiasts which hosts thousands of fans from all over the world every year came to an end. From Thursday, May 19th, a large number of fans and brightly coloured Vespas began to crowd the town of Gjøvik, about one hundred km from Oslo, and they celebrated the definitive scooter-legend for the entire weekend. The "four-days" Vespa was one exciting event after another: from the Vespa rides in the area around Gjøvik to the evening shows with music and performances. There were many participants for the excursion scheduled on Friday, May 20th on the streets of Lillehammer, the famous town which hosted the 1994 winter Olympic games. The highlight came, like it does every year, on Saturday morning: at 9:00 AM on May 21st, the first Vespa riders had already begun to gather to be ready at 10:00 AM for the grand parade. Thousands of Vespas, lots of different colours and models, from the most vintage models to the new range, paraded in a lively procession for more than 80 km: Like every year, no one missed out on the chance to show off their Vespa. An acrobatic show on Vespas concluded the saturday parade. Saturday evening, after the gala banquet, with more than one hundred fifty tables set for the thousands of officially registered Vespa riders, the awarding of the Vespa Trophy was the prelude to a festive evening with live music, dancing and acrobatic shows on Vespas to delight and excite all of the fans. Club Vespan e Salam won the competition between the travelling Vespa riders: departing from San Damiano D’Asti, with more than 3000 km travelled and 7 countries visited, the members of Club Vespan e Salam won the second edition of the Vespa Trophy, the touring trophy which was established in the 2010 edition of Vespa World Days in Fatima which rewards Vespa Clubs from all over the world. The help and participation of Piaggio dealers all over Europe is fundamental for this fun and enthralling Vespa competition. More than 2000 Piaggio dealers participated in the initiative stamping countless Travel Books: a stamp for each stop made by the Vespa Clubs headed for Gjøvik before the conclusion of the competition on Saturday afternoon. The Norwegian edition of Vespa World Days confirms the fifth consecutive success of an event which involves all Vespa Clubs of the world. It was the year 2007 when, in San Marino, thousands of Vespa riders of all ages gathered together for the first Vespa World Days to set the appointment for 2008 in Cefalù, in Sicily, and for the next year, June 2009, in Zell Am See, in Austria. In June 2010 in Fatima, Vespa World Days renewed the invitation to neo-enthusiasts and seasoned patrons, for the 2011 edition to celebrate the values of friendship and adventure which Vespa has symbolised for 65 years, this time in Norway. The history of Vespa-based gatherings has much deeper roots: in 1953 the first Euro Vespa was born which renewed the appointment with Vespa riders each year until 2007 when, to involve Vespa enthusiast from all over the world, it changes its name to Vespa World Days. Today, there are 40 National Vespa Clubs associated with the Vespa World Club and over 700 registered local Vespa Clubs, for a total of nearly 40,000 members world-wide. Vespa World Days 2011 edition was, once again, an event long awaited by many, which involved thousands of people and thrilled Vespa riding nomads as well as many Norwegians, fascinated and astonished by the many Vespas. The most incredible story this year, however, was perhaps written by a newly-wed couple from Montemarciano near Ancona which, in Fatima during the 2010 edition, planned their wedding a week from the Vespa gathering so that they could begin their honeymoon at the Gjøvik 2011 edition of Vespa World Days. The next appointment will be in London in 2012 for another fun-filled and colourful edition of Vespa World Days. Mojo Motorcycles & GE Capital announced that from 1st July 2011, GE Capital will be the exclusive floor plan provider to the Mojo Motorcycles national dealer network. Furthermore, approved dealers with existing GE facilities can participate immediately. The Mojo Motorcycles stable of specialised brands includes TGB, CF Moto & Daelim. This move demonstrates GE Capital’s consistent dedication to the motorcycle industry and cements Mojo Motorcycles position as a serious independent force within the industry. A Mojo Motorcycles company spokesman was thrilled about the relationship. “Consumers will be the real winners, as the dealer network will have the capacity to carry a broader range of new models, colours and demonstrator units on their showroom floors”. This relationship will foster the consistent growth Mojo Motorcycles has experienced over recent years. “According to official FCAI data, during 2011 TGB & CF Moto achieved industry leading sales growth, and the partnership with GE Capital will facilitate this trend in 2011 and beyond”. GE Capital has filled the void of the major banks in providing floor plan finance in the Australian motorcycle industry. Mojo Motorcycles is an Australian owned company, the exclusive distributor for TGB, CF Moto & Daelim brands. Their strong product portfolio is both innovative and value driven and targets key segments within the industry: scooters, commuter & leaner approved motorcycles and ATV’S/UTVS. With consistently strong sales growth, they have become a leading independent motorcycle distributor. GE Capital is part of the global GE Capital business, which operates in 55 countries around the world. Employing over 4,600 people and being the fifth largest lender in Australia and New Zealand by assets under management. Over the last 7 years, GE Capital have invested and lent to customers more than $170 Billion. These include GE Money’s personal loans, credit cards, personal insurance and interest-free promotional and retail offers, while GE Capital’s commercial finance divisions offer distribution finance, fleet management and leasing, supply chain finance, insurance and real estate finance. Furthermore, GE Capital has a dedicated team specialising in motorcycle distribution and floor plan finance. Launching later this year, we get a small taste of what to expect when the new G-MAX 220i arrives. Launching later this year, the first G-MAX to hit the country has arrived, ready for approval on Australian roads. We were lucky enough to be handed the keys for an early taste, and now cant wait for the full meal. 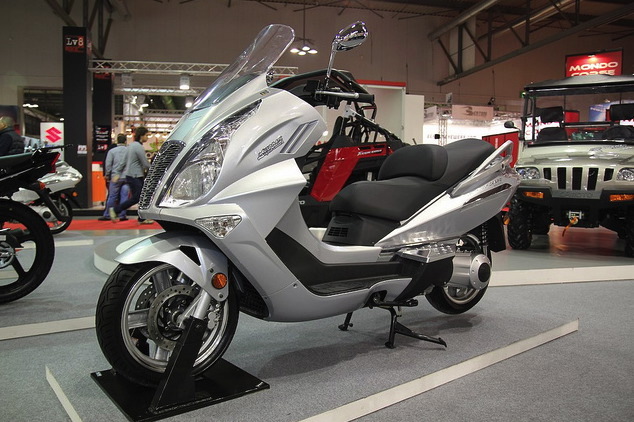 The G-MAX 220i runs an impressive set of specifications which are dominated by one item, the central motorcycle type frame. This shapes the overall style and handling of the G-MAX, making the intentions very clear this is one for the sports enthusiasts. The 220 cc engine is injected, runs an oil cooler, and has the ability to be tuned through a CDI plug-in (refer gallery), which does broaden the scope for future performance tuning. The engine also runs the same NASA piston technology as the X-Hot. Other stand out features include the centrally mounted shock, twin wave discs, digital dash and key operated seat/fuel on the 6 in1 ignition. I had the G-MAX with only a handful of K's, yet still easily rocketed to 100 km/h. The exciting thing here is that you have a chassis that will cope with anything you can throw at it. One that feels extremely connected in the feedback that it provides the rider. For me, the next step would be to add a few bits here and there, additional tuning and create something very special. Something you could do and not break the bank, given the base price will be around 5 grand. 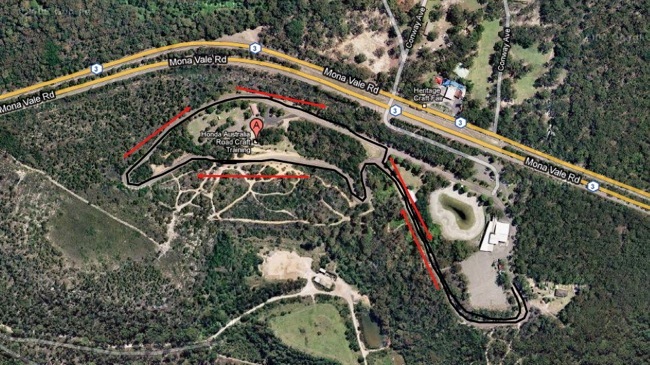 Also if you live in NSW, the G-MAX sits in the cheaper rego category, under green slip cut off point. When Richard Costello was involved in an accident while riding his 1958 BMW R 50 more than 40 years ago, he promised his pregnant wife he wouldn't ride again until their children had grown up. Decades passed, and Richard never made it back into the saddle. But he couldn't bear to part with his machine and it stayed in storage. Two years ago, he died aged 71 after suffering a stroke. His bike had not been ridden since 1969. However, desperate for his pride and joy to one day be back on the road, Richard had secretly penned a note to his son, Bill. It was while Bill was looking over the R 50 after his father's death that he found the scrap of paper fixed to the bike's handlebars. It told him where the spare parts were kept and read: 'I want the bike fixed as well as I know you can do it'. Those sentences changed Bill's life, as he learned to restore, ride and love the R 50. In a further tribute to his dad he created a video slideshow telling the story of man and machine, set to Pearl Jam's 'Just Breathe'. The film struck a chord with people around the world, attracting more than 360,000 YouTube views to date. Bill, who lives in New York with his family, says he finally understands why his father turned down his repeated offers to fix up the bike. "I'd say: 'let's get it back on the road', but he'd always turn me down. Now I'm sure it's because he wanted to leave it for me. At first I felt overwhelmed by the restoration, but doing the work gave me an amazing connection to my dad - it was my way of keeping him alive." He insists that the R 50 could not have been transformed without the help of BMW enthusiast Peter Nettesheim, who owns a huge private collection of BMW motorcycles. Bill heard about Peter while researching how to restore the R 50 and, after hearing Bill's story, Peter agreed to help him get the bike back on the road. "I couldn't have done it without him - he was the one who rescued the bike. He came to look at it before we started and said straight away, 'I can get this bike going again in about half an hour'. It hadn't even been started in 40 years so I didn't think he'd be able to, but he did. That was the moment I knew we'd be able to do what my dad had asked." The R 50's story is captured in Bill's YouTube video. The three-and-a-half minute clip uses no words, just photos and the song. The very last picture is of a plaque dedicated to his dad, which Bill had fitted to the R 50. "The video was just for my family really, the Pearl Jam song reminded me of him, and that's what actually inspired me to make the video." When the film began growing in popularity, it attracted thousands of comments, mostly from people who wanted to let Bill know how much they had been touched by his story. Unfortunately, the attention also saw him reported to YouTube for using the Pearl Jam track without permission. Bill, then out of work, found himself with a $1,000 fee. Reluctantly, he asked people to contribute toward the amount and set up an online donation page which would automatically close when the total was reached. Money came in fast, then slowed to a trickle until Bill suddenly received an email. Overnight he had made his $1,000. It turned out the mystery benefactor was BMW. "I got an automatic message to say the fundraising page had shut down, which I was really surprised about as it had been around $300 the night before. Then I got a cryptic message saying 'you'll probably have noticed the amount has been paid in full', which turned out to be from BMW." Bill has since been invited to the annual BMW Motorrad Days event in Germany this summer and is now deeply involved in the world of BMW motorcycles. 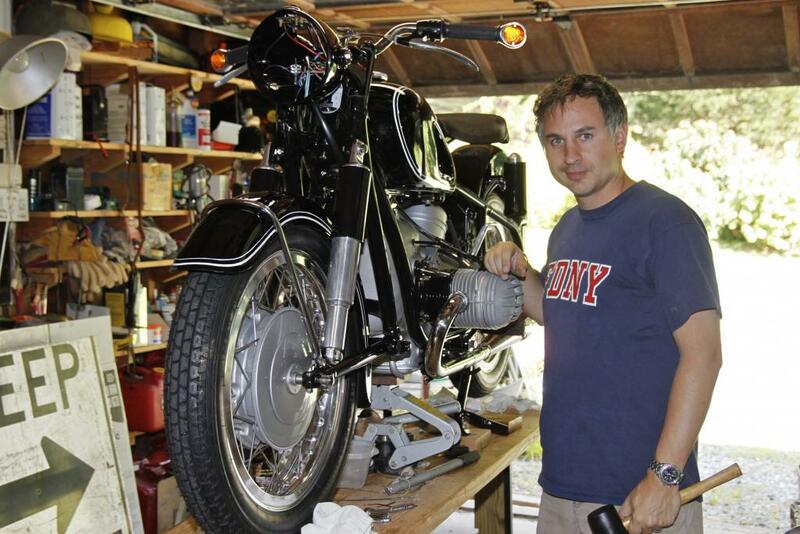 He has a new network of friends and has become the subject, author and photographer of a series of articles on the restoration published in enthusiast magazines including On The Level and Motorcycle Classics - America's biggest classic bikes magazine. "It's opened up a whole new world to me, one which without my dad I'd never have become part of. I think he'd be proud - and I think he'd like the attention he's getting too." To see Bill's video, please visit www.youtube.com/watch?v=NdBptlmu7kA and please leave a comment for Bill, as hundreds of enthusiasts have already done. There will also be a LIVE CHAT with Bill Costello at this year's BMW Motorrad Days. More information will follow shortly. Hyosung Australia have just announced price cuts of up to $1300 across a number of its learner friendly models. Australia's robust economy has provided significant pricing advantages for Aussie riders and Hyosung has made it clear they will continue to pass these savings on. The savings on the GT series and the GV250 cruiser, are in addition to savings announced earlier in March for the entire Aquila 650 cruiser family. "We have the most powerful LAMS bike on the market, that are full sized and come in a variety of models to suit all riders, and they are now even more affordable" said Hyosung Sales Manager Brendon Roberts. He added "Seriously, there has never been a better time to get on a Hyosung". The price reductions' are effective immediately. The Manufacturers List Price (MLP) is the component to which other components must be added to calculate a single or ride-away price. Components can include but are not necessarily limited to Registration, CTP, Stamp Duty, Dealer Delivery fee, Transport etc. Founded in 1978 as a division of the massive Hyosung Group, Hyosung Motors & Machinery began producing motorcycle designs under license for the South Korean market in 1979. In 1986, Hyosung established its own research and development centre in Japan and, the following year, began mass production of its own deigns. Hyosung was the official motorcycle supplier for the 1988 Summer Olympics in Seoul. In 2003, Hyosung Motors & Machinery was spun off from the Hyosung Group and remained its own corporate entity until it was recently absorbed into one of the biggest companies in South Korea – S&T Motors. S&T's goal is simple: to become one of the major players in the global motorcycle industry. The massive company is committed to strengthening its international competitiveness through a vigorous research and development process. In just 20 years, Hyosung has made a highly successful transition from producing simple, efficient bikes for commuting into the highly competitive recreational market. Filed under: Hyosung Slashes Prices! A world of Kymco awaits online. 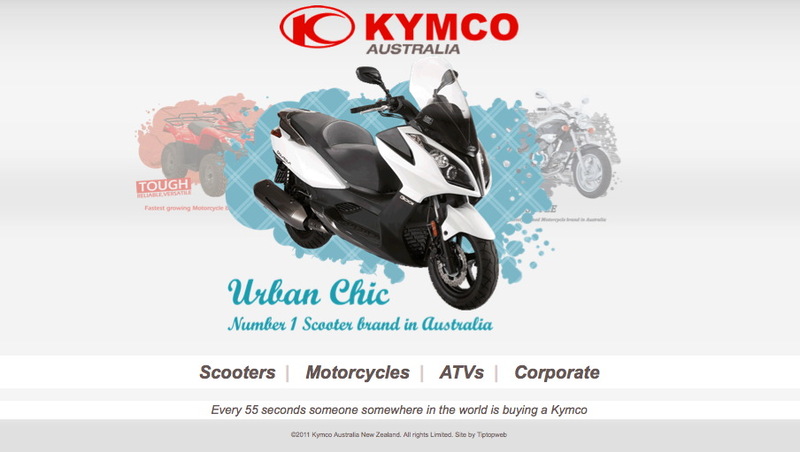 Take a look at the new look Kymco Australia website. Something is very clear, Kymco as a brand is here to stay. 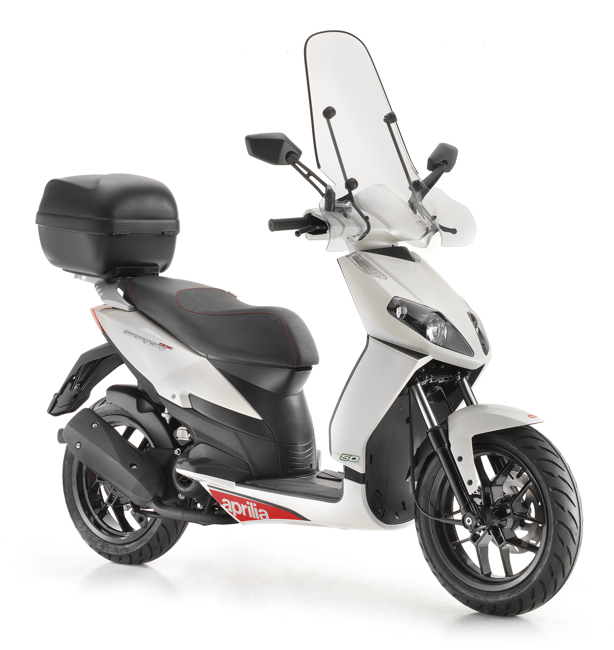 An ever increasing model range across three categories, Kymco has made a flying start to the 2011 calendar year. Kymco has now added to the list of achievements for 2011, a new brand website. A new look and feel is accompanied by a new home for each scooters, motorcycles and ATV's. So what can we expect to find. Well, you'll find each model has its own micro-site with a featured area that allows the user to spin models in full screen 360 degree rotation. Take a look through a large array of feature shots and whilst you're at it, take a look at a list of up-to-date specifications. Find the latest news on Kymco Scooters, Motorcycles and ATV's and check out who is this months, "Dealer of the Month". This month it just so happens to be Scooterworld/Close Motorcycles at Redfern. Do a dealer search just by entering your own suburb or download a brochure from the Kymco Corporate site. Don't forget whilst visiting to sign up for the Kymco newsletter. 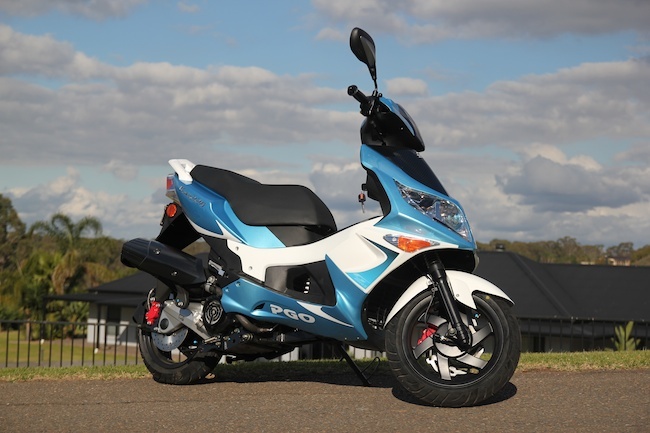 This is just the start of things to come for Kymco Australia. 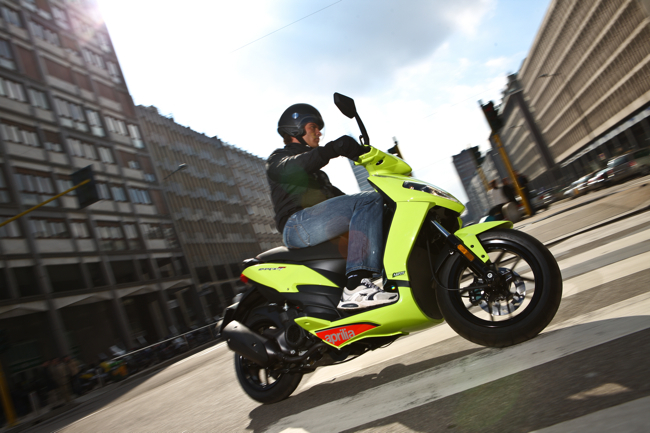 For now have a browse, have a play, and explore the new online world that is Kymco! Coming soon, a maxi styled, liquid cooled and fuel injected scooter for under 4 grand. 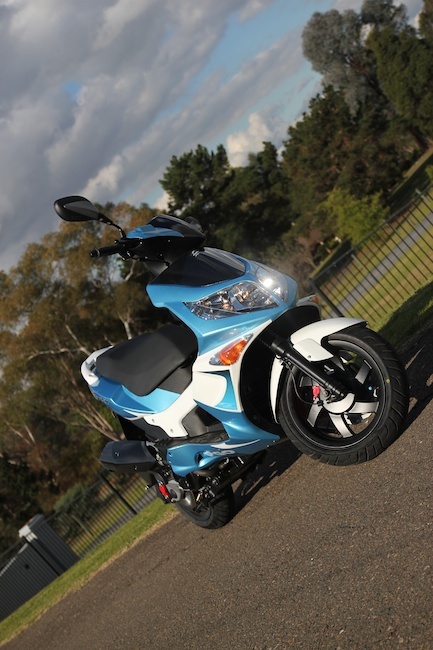 CF-Moto are continuing to forge ahead in Australia, the brand expanding into a nice little broad range of models. CF-Moto as a brand is imported into Australia by Mojo Motorcycles, responsible for other brands like TGB, Sachs and more recently Daelim. The reason for this article is that the JetMax 250 will be released by CF-Moto shortly, we saw it for the first time at Eicma last year. 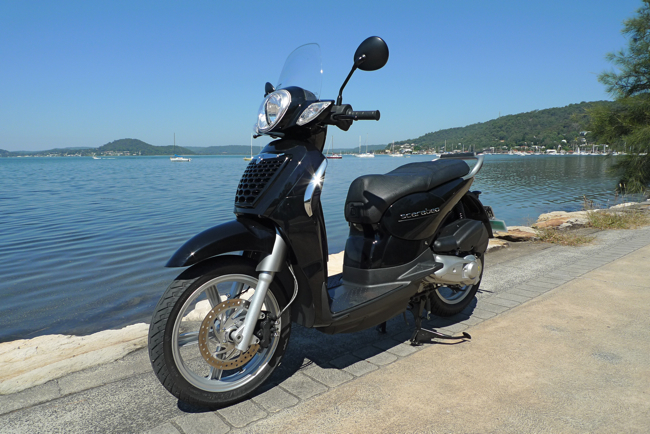 A full size maxi style scooter capable of both the daily commute or the weekend getaway. The JetMax runs a 249.2 cc liquid cooled, fuel injected motor rated at 16.5 Kw, impressive for a Chinese built machine. This is also CF-Moto's own motor that has been built and designed in-house. Basic specifications include a shed load of storage, 15 (F) / 14 (R) wheel combination, twin 230 mm front disc brakes and electric pillion pegs (Yep!). Twin front headlights take up styling responsibilities at the front and a rounded boot helps with space at the rear. We will be putting the JetMax 250 through its paces shortly once Mojo get the final nod of approval for Australian roads. The value equation will be fairly interesting given the proposed retail price will be under $4000. So given the specs and CF-Moto's ability to build above "the norm" Chinese products, we'll set out to prove how much $4000 can actually buy. A quick look at the local scooter market at the end of April 2011. Where are all those US Dollar savings? Those people looking at the Aussie dollar and wondering why we are not seeing an overall reduction in retail pricing might be disappointed. Most importers are facing price rises out of Asian countries over the next few months, so why is this? Given the Aussie Dollar just keeps rising against US currency, retail prices here in Australia have pretty much kept running at a steady pace. From a recommended retail perspective we have not seen the movement one might expect. This is all due to the fluctuations of both the Yaun (Chinese Dollar) and the TWD (Taiwanese Dollar) against the US Dollar. Most Australian Importers deal in US currency with either Taiwanese or Chinese manufacturers, so the pressure keeps coming from both quarters as the US Dollar weakens. Adding to this pressure has been the increasing cost of resources, this being the base cost of materials that a manufacturer would use to build a scooter. Another would be the record rate of inflation in China which is currently running at around 5.4% at the end of March 2011. China reported an 11.7 % increase in food prices alone in April of 2011. This is placing additional pressure on wages from a manufacturing standpoint. From a local market point of view, things remain steady, if not a little fragile. Market statistics would have us see a scooter market in rebound, though for 2011, this will be very much reliant on the cost of fuel and the ongoing pressure on interest rates through high inflation. The Australian economy remains driven by a hot resource sector and the media speculation around interest rates is increasing. So we do seem to be seeing some form of slow down on the spending of disposable income. Add in the factors we already know about, the increasing cost of everyday living (power, food, fuel), and we have any number of influences applying the brakes. April scooter retail figures (FCAI) indicate that the market has lost some of that bounce that had returned in the first quarter of 2011. Though, these numbers need to be factored against a lengthy Easter/Anzac public holiday and long periods of wet weather across some east coast locations. Also heavy discounting in some market segments has driven retail sales in April, this will have an additional impact on the overall health of the industry. The positives for the scooter market are that consumers are still looking to save money. A scooter can be a tool that will perform this task, a proven and reliable one at that. 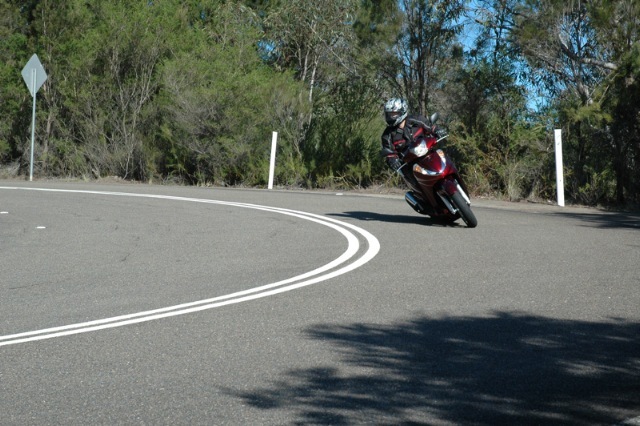 Taking NSW as an example, the wait to get into a rider training course is still lengthy, so the demand to get onto two wheels remains strong. In other positive news we see the US scooter market with a 50% increase in sales, increases in the cost of gas being the driving factor. Sales of just over 6000 units for the 1st quarter of 2011 versus just over 4000 units in the same period for 2010. For Australia, 2011 may well be the rebound year if consumers look to save themselves from spiralling daily household costs. The choice of scooter models in the Australian scooter market remains strong, the major brands all have models which will answer the task of daily commuting. Each state market remains different with licensing the major differentiation. You can still ride a scooter on a car licence in QLD, WA, SA and NT. In all other states you require a licence to ride a scooter, though the training in getting passed the course does help. For a 50 cc scooter expect to pay around $2000 Ride Away (+ or -) in states where the licensing laws suit. This is where the market starts and you can go a little higher on the purchase price if you want to lift the overall quality and performance. In states where you require a licence for any kind of riding, the general area of the market is plus or minus $3000 Ride Away. A figure that will get you a 125 - 150 cc scooter capable of the majority of ones commuting needs. From our perspective make sure you visit your local scooter retailer and ask what they have on special, especially over winter. You'll be surprised by the value on offer and what your dollar can actually buy in today's climate. In our travels we see a great number of in-house specials and I'm always amazed with the depth of quality and performance you can get these days for the price. Some dealers are getting the benefit right now of buying in bulk and taking advantage of any gains in the high Aussie Dollar. Never a better time to get on a scooter, we certainly think so here at Scootersales.com.au. 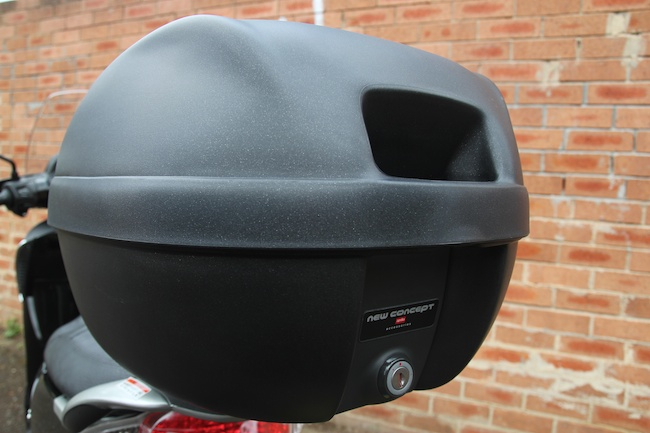 Free top box and rack on Sportcity One 125 and free top box on the Scarabeo 200. Increase both value and storage for a limited time. Aprilia are relaunching the "Get a Free Top Box Deal". Buy either the fuel injected Scarabeo 200 or the sporty Aprilia Sportcity One 125 and receive a free Top Box till stocks last. The New Concept box significantly increases storage, the only area they could both do with a little helping hand. The top box is Aprilia's own unit that will easily hold a full face helmet, it's lockable, removable, and accessed by its own key. What about a rack I hear you ask? The Scarabeo, as a few of you may know, comes with a ready made rack, whilst the Sportcity One requires a rack for fitting. The rack comes supplied as part of the deal. Both scooters offer top value already, the box offer is just the icing on the cake. The Scarabeo 200 i.e. needs no introduction with its fuel injected, 4 valve engine, capable of highway speeds. It's a truly capable performer and one that can take up the duties of the daily commute with enough left over for the weekend jaunt. The Sportcity One on the other hand is a budget commuter with all the makings of an urban warrior. Sporting alloy wheels that replicate Aprilia's supersport range, the Sportcity One sure does look the goods. Goes well too, thanks to a solid performing 125 cc 4 stroke engine. So something for everyone, sports or classic, you make the choice. The Sportcity One 125 retails for $2990 + ORC, whilst the Scarabeo 200 retails for $4990 + ORC, both with the free box.